The Durotriges were one of the Celtic tribes living in Britain prior to the Roman invasion. The tribe lived in modern Dorset, south Wiltshire, south Somerset and Devon east of the River Axe and the discovery of an Iron Age hoard in 2009 at Shalfleet, Isle of Wight gives evidence that they lived in the western half of the island. The Durotriges were more a tribal confederation than a tribe. They were one of the groups that issued coinage before the Roman conquest. 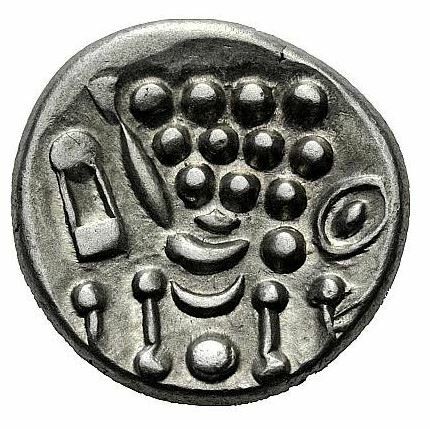 These coins were rather simple and had no inscriptions, and thus no names of coin-issuers can be known, let alone evidence about monarchs or rulers. Not surprisingly, the Durotriges resisted Roman invasion in AD 43, and the historian Suetonius records some fights between the tribe and the second legion Augusta, then commanded by Vespasian. By 70 AD, the tribe was already Romanised and securely included in the Roman province of Britannia.